Penn Systems Group offers a service bureau, staffed with full time professionally trained employees, to fulfill all of your microfilm and scanning needs. 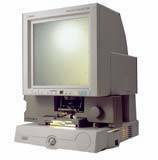 The MS-300 easily integrates scanned microfilm images with today's document management systems. Standard PC and network printer connectivity simplifies image retrieval and provides digital conversion of film archives. Once scanned, images are ready for delivery via the Internet, E-mail or fax. Ideal for financial institutions and walk-up use in libraries, or as a component of a high-end imaging system. With many automatic and motorized functions, the MS-350 is the premium microfilm scanner suitable for all of your business needs. All primary controls are also available on the Remote Keyboard providing the convenience and expediency necessary for busy operators as well as those with disabilities. The MS-350 gives you the ability to easily and efficiently retrieve images and convert film archives into digital files with Canon's bundled CapturePerfect Software, for printing, E-mailing, faxing, or storage. Print from your local or network printer connected to your PC, or turn your microfilm scanner into a high-productivity Digital Microprinter System with the optional DMP board and one of Canon's compatible compact laser printers. The Canon Fileprint 450 laser printer, with large-capacity paper cassettes, delivers high-quality laser printouts from letter to ledger-size. For optimum efficiency, there's Canon's economical, Fileprint 250 laser printer for letter-sized printing a real spacesaver, its reliable output will enhance your workflow. Full network connectivity plus flexible image transmission capabilities bring a new level of operational convenience to high performance digital microfilm scanning. Start with a wide-screen microfilm scanner capable of handling everything from checks to blueprints, newspapers, and more. But make it compact enough to fit on any desktop. Then raise the bar by pushing output resolution up to 600 dpi. And design it for high speed, simple operation, great versatility, easy connectivity, and fast throughput. While you're at it, make it affordable, too. You'd probably want to call it the perfect solution to your ever-expanding workgroup needs. eCopy Desktop is a client-based software that provides network users with the ability to treat eCopy document files just like paper, right on their desktop computer. With eCopy Desktop, users can view and annotate, perform Optical Character Recognition (OCR) to generate editable text, and store or distribute eCopies from their desktops. eCopy Desktop also allows users to combine or separate pages from multiple eCopies, to create a new document of selected pages, or attach a signature stamp. 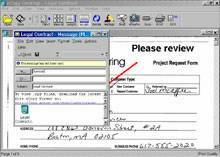 For easy distribution of eCopies, the Desktop software uses the system's native e-mail application to create e-mails with the eCopy as an attachment. Users simply employ the familiar e-mail interface to select a recipient, add a subject line and cover note, and send the eCopy on its way. eCopy ShareScan OP (Open Platform): eCopy ShareScan OP for MEAP-enabled imageRUNNERs offers all the functionality of eCopy document distribution and integration solutions inside the Canon MEAP-enabled device. No additional hardware or dedicated servers at the copier are required. Additionally, with eCopy ShareScan OP's easy to use administration tools, administrators can manage multiple eCopy-enabled devices from one central location. It also offers increased flexibility with eCopy's Quick Connect feature or, for more advanced integration, a software developer kit (SDK) is available. 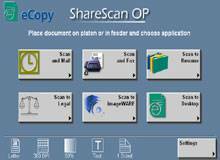 eCopy ShareScan OP ships with licenses of eCopy Desktop software. eCopy Desktop: eCopy Desktop provides a powerful set of document workflow tools that enable individual users to treat eCopies of paper documents just like electronic files right from their desktop workstations. eCopy Desktop works with most network fax, e-mail, and document management applications: including, Lotus Notes Mail, Microsoft Exchange/Outlook, Captaris RightFax (NT Server), Interwoven, Domino.Doc, Documentum, and others. 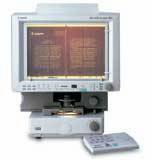 A unique system designed to make images on microfilm and fiche truly accessible to anyone. Developed for Canon's popular line of microform scanners, even the most demanding public access applications no longer have to be a daily challenge. The image.SCAN system guides even first time users through the process of capturing high quality digital images from microforms, without the involvement of staff. The specially designed easy-to-use interface can be accessed in English, Spanish, or French! Users are presented with a very simple, touch-screen enabled interface that utilizes tutorial videos to guide them through everything from loading film or fiche to capturing their images electronically.